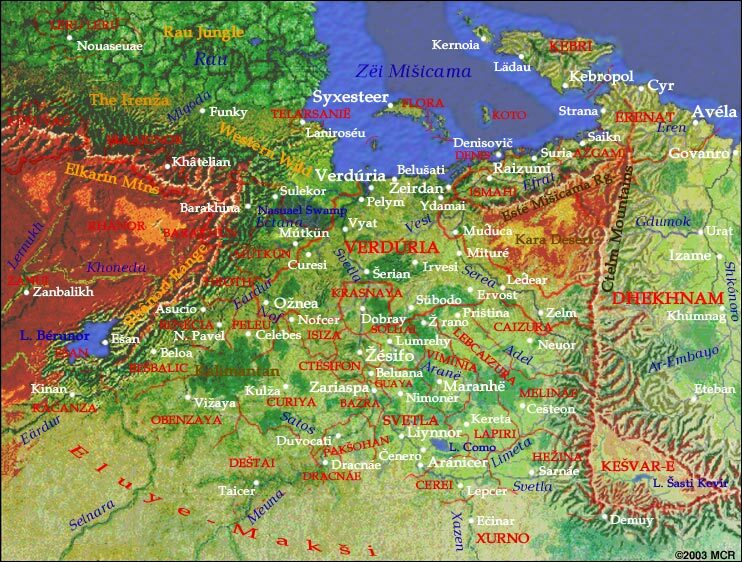 The focus on Almean studies is Eretald, the Southern or Caďinorian Plain, and its dominant kingdom, Verduria. Unlike most fantasy worlds, Verduria does not correspond to our Middle Ages; socially and technologically it is most comparable to our 17th or 18th century. Verduria and other advanced Almean states have already rediscovered classical learning, and worked out the scientific method (soa žuyse onteca), the joint-stock limited-liability corporation (cumbutát imbineyul), and parliamentary monarchy. The first factories are beginning to be built in the larger cities. Printing, clockmaking, and shipbuilding are well advanced; indeed, Verduria has founded its first overseas colonies (Lean and Karáumia on the east coast of Ereláe; and Téllinor on the western coast). Planets do not develop at the same pace. Verdurians are ahead of terrestrials of the same technological level in the areas of biology and linguistics, having already elaborated the theory of evolution (ulečea) and reconstructed proto-Eastern (so pere řon), the protolanguage underlying their own and many other modern languages. They are behind in terms of military technology; they've invented the cannon, but Verdurian firearms still tend to be more lethal to the shooter than to the target. And the machine loom and the steam engine are still in the future. The first civilized states in the Plain belonged to the Monkhayic peoples, c. -1150. These states were swept away c. -375 by the Easterners-- no longer speaking proto-Eastern, but early Karazi and Central languages. The Karazi peoples were the more advanced of the two groups, and founded the kingdom of Cuzei in the Eärdur valley, notable for its monotheistic religion and extensive literature. The Central peoples remained barbarians and polytheists, and were conquered in 440-455 by the Munkhâshi, beginning a long and bitter struggle which culminated in the unification of the Central peoples under the Caďinorian Empire and the expulsion of the Munkhâshi from the Plain. The Caďinorian Empire absorbed the declining Cuzei-- not without struggle-- and prospered for nearly a thousand years. Magnificent Caďinorian ruins still dot the Plain, and the ancient capital of Ctesifon is still impressive. At its height (c. 1750) the Empire encompassed the entire Plain as well as most of the former territory of Munkhâsh to the east. The Empire declined, succumbing to civil war and tyranny with the usurpation of the Red Cabal (soa Ružë Clečura) in 2107. At the same time the military balance of power had shifted to the nomads of the open plains south of Eretald, who had learned to fight on horseback (rather than from chariots, as in classical times). The Plain suffered one barbarian invasion after another. Ctesifon itself was occupied, not for the first time, by the Bešbalicu in 2435. The apogee of the barbarians' power was the continent-spanning empire of the Gelyet (26th century). Numerical growth and military innovation have restored the fortunes of the agricultural states; and the Plain has emerged from its Dark Years. The kingdom of Verduria was proclaimed in 2943, and soon came to dominate the northern Plain. Classical learning has been revived and surpassed; and the Verdurians, traders and sailors, have created a more commercial and exploratory culture than the Caďinorians ever did. The religious and linguistic unity of the Plain has been lost. Caďinor, the language of the Empire, has become a family of languages: Verdurian, Barakhinei, Benécian, Ismaîn, and Sarroc. And Caďinorian polytheism has found itself in competition with Eleďát, a composite of the ancient Cuzeian religion with the new teachings promulgated by the Eleniki, who arrived in Eretald in 2780. Kebri, an island nation, Verduria's chief rival at sea. The Kebreni are particularly gifted at an aggressive style of trading, the kind that's backed up with warships; some of their overseas trading posts are incipient colonial administrations. Kebri is the only major state which still speaks a Monkhayic language. Érenat, located on the coast opposite Kebri, its traditional enemy. The Eleniki made their landfall in Érenat's capital, Avéla, and Eleďát is the majority religion. Printing was invented in Avéla, which is still a center of publishing and scholarship in the Verdurian language. Ismahi, on the coast east of Verduria. It and Azgami speak Ismaîn rather than Verdurian, and are known for despotic government, art & decadence, and the Plain's best guitar playing. Žésifo, politically a minor state, but important (especially in its own eyes) because it contains the ancient Caďinorian capital. Flora, an island nation just north of Verduria, inhabited by the flaids, another intelligent species. The flaids are peaceable (but since they are taller than men, they get little trouble from them); they're known in the Plain for their manufactures, their philosophy (Irreanism, which has won human adherants as well), and their folk tales (e.g. horror tales about the ubir or vampire). My first short story, at the age of 11, was about the flaids, and I've had a soft spot for them ever since. Barakhún, the Mountain Kingdom, to the west of Verduria, known for its mountain-perched fortresses, its fierce warriors, and a cuisine considered the worst on the Plain, based on dried meat and pickled vegetables. Barakhún, Mútkün, and Hroth speak Barakhinei rather than Verdurian. Benécia, farther down the Eärdur, speaks a distinctive dialect, in between Verdurian and Barakhinei. The Eärdur valley was the home of the ancient Cuzeians, and has preserved its tradition and beliefs to this day; Eleďát is particularly strong in Benécia. Svetla, a confederacy of baronies and free cities, the most prosperous of the southern principalities. Its capital is Aránicer, the most ancient of the Caďinorian cities (older even than Žésifo). Viminia, a largely rural nation southwest of Verduria. Every nation has another it makes jokes about, and for Verduria it's Viminia.